The kitchen is one of the spaces that are used the most in the house so it should be well-kept and organised. This will also make your meal preparations easier and makes everything look neat as well. 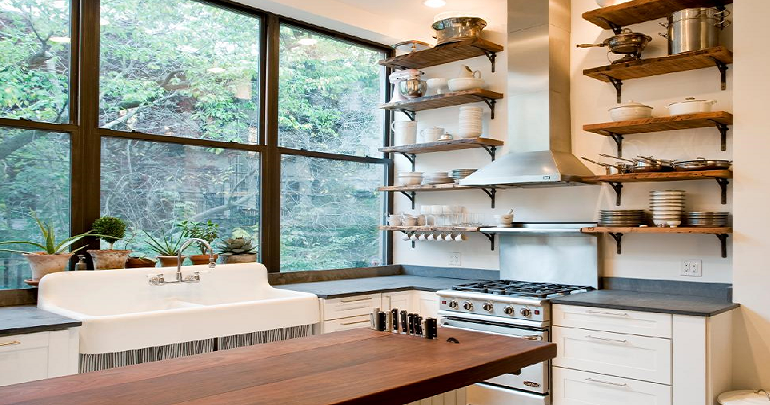 Learn how to keep your kitchen uncluttered and immaculate at all times. Start by hanging items that are frequently used such as oven gloves, aprons, dish towels and similar items on easy to reach hooks. But make sure that they are not in the direct line of the stove otherwise they will get dirty easily. Sometimes you may have extra space under some shelf or cabinet which can be used for various storage options. Take advantage of these space by adding some boxes or crates to make sure that every inch of space is used. All that open vertical space is right at your fingertips and available for use so you should definitely utilise it. Floating shelves are a great way to store your kitchen items in various ways. If you find yourself running out of tabletops to prepare your meals then you can consider adding a standalone kitchen island to make sure you have ample space. This kitchen island can also be outfitted with hooks and drawers for more storage solutions. Keep your pots and pans easily accessible with a handy hanging pot rack which means that you don’t have to go digging through various drawers for the ones you need. It not only saves time but allows you to save precious drawer space. Make use of awkward corner cabinets with a carousel-style rack where you can store many items. It easily spins to allow you to reach the items in the back. You will be surprised to learn that even your kitchen door can be used for storage, by hanging some neat racks behind the door. Stack your items inside the rack for convenience. Pull out drawers are always a good storage idea no matter what you want to store. It can be used in many areas of the home and lets you reach the items stored at the back easily. Storing your foodstuff in storage bins that are visible is a great idea because you can easily see at a glance what needs replenishing or which item you want to use. Smaller items also won’t get lost easily. Keep your frequently used items out in the open but make sure it still looks neat and organised with these clever open storage solutions. There are even dedicated knife slots at the kitchen island for each of your knives for easy selection. Every inch of real estate in the kitchen is valuable and should be fully utilised to keep your kitchen looking clean and neat. Make sure to look for nooks and crannies where racks or shelves can be squeezed to get that much needed space.